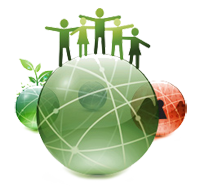 The social element is one of the four different features of bgreen. Considering the premise “Think Globally, Act Locally”, bgreen proposes getting down to work so as to improve living conditions of local communities. The social project is made up of volunteer students from the organizing school, that promote environmental intervention and awareness sessions for the region’s disadvantaged population. To this end, all sessions are carried out in close partnership with the municipalities of Santo Tirso and Vila Nova de Famalicão. With such project, in addition to putting into practice the environmental, pedagogical and solidarity principles that the festival upholds, we are also contributing to the development of youth as individuals, instilling in them values such as respect for others, equality, commitment and responsibility which are inherent to OFICINA’s educational project. For every ton of recycled glass, we save up to 1300 kg of sand and diminish water and air pollution.